Is the OA Nano Brace right for me? Ideal for mild to moderate osteoarthritis this brace will help you remain active and move freely. Try our Brace Advisor for personalized product recommendations to meet your needs! The DonJoy OA Nano is extremely lightweight. This brace unloads (mechanically shifts weight away from the damaged pare of the knee). For mild to moderate knee osteoarthritis, the OA Nano is designed for people to stay active and move freely. One of the best aspects of this braces is it provides people with knee osteoarthritis with an option to help alleviate pain and stabilize their knee with a non-invasive, non-addictive treatment options. To make this brace lightweight material science collides with innovation to create high-tech functional comfort in a lightweight design. The flexibility of the magnesium frame allows for an intimate fit while the revolutionary nano MAG material provides strength to off-load and help provide pain relief. At just 14.2 ounces this brace won't slow you down as you go about your daily activities. DonJoy's Adjuster technology off-loads (mechanically shifts weight away from the damaged pare of the knee) a little - or a lot. Looking for liners, condyle pads or straps? Shop OA Nano Replacement Parts. The DonJoy OA Nano Knee Brace is an adjustable unloading brace, which should shift the weight to the lateral side, relieving some of the pressure to the medial side. After reading through your site, I think I have lateral OA. Do I need a prescription to order your product? No you do not. BetterBraces is an online retail store. I have a partial tear in my ACL, and I'm wondering of this brace will be a good option for post ACL surgery? I need to get replacement straps and padding for the right leg Nano. Do you sell these? I need to unload off of the medial side. Which option do I select? Medial? This is for my left knee. Thanks. When selecting which side to unload. Select based on your Diagnosis. If you have Medial OA, select Medial when you place your order. Based on your diagnosis, There are a couple of options to choose from . 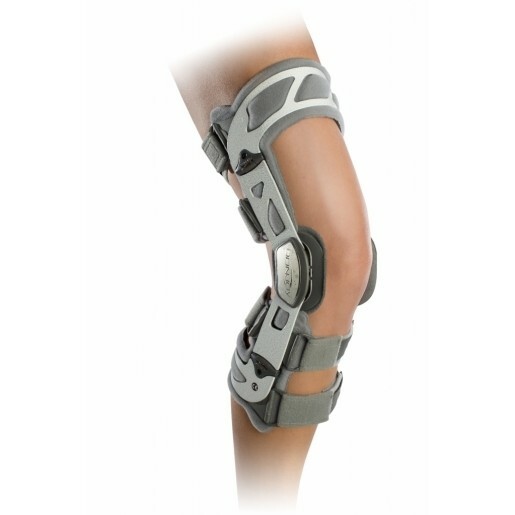 A hinged knee brace will provide you with general support of the knee joint but it will no unload either side of the knee. The Don Joy Playmaker II would be a good choice since it will also provide ACL support. We also have braces specifically for arthritis called unloading OA Braces. These brace can unload either the medial or lateral side of the knee to provide decreases in apin on that side of the knee. You can only unload one side not both, so if you wanted to get one of these types of braces, you would only be able to unload one side. The OA Adjuster 3 would be the appropriate brace for severe OA. I had a fractured femur in the knee joint the oats procedure is what was used to repair it. I now need a unloader brace at times of high activity as from the injury my alliginment is poor it feels sometimes like bone on bone and the unloader removes the contact from the inside of my knee would this be a good brace or what would you suggest. I currently have a custom Townsend brace and sleeve. The OA Nano is best for moderate OA and a highly active person. The frame is made of magnesium so it would not be for contact sports and it will unload one compartment of the knee. December 2008, I had the first of two different trauma injuries to the right knee. Although one year apart from each other, these accidents resulted in two full knee reconstruction surgeries. Since then I've had orthovisc injections, I've worn a knee brace, have spent thousands on P/T and pain meds - and as I get older (and heavier) I'm finding it more important to exercise and I'm less and less able to do so. After 7 years of "doctoring" this knee, I went to a new orthopedic doctor who suggested an "unloader" brace. Here is the rub... I have pain on both sides of the knee (medial and lateral), as well as patella pain which is probably the most excruciating of all. Since having the first surgery, I've also developed arthritis laterally. I am 47, female, 5'6" tall and currently weigh 185 lbs. - I need to get active again so that I can reduce my weight with a goal of 145 lbs. My current brace is a don joy for ACL injuries and I find I can only wear it over top of leggings with a tunic top, or under a dress. Unfortunately, I find that wearing my brace all day, every day is the only thing that helps...yet I still have pain. (likely because it is not an offloader brace) My doctors office recommended the Nano. 1. Will it fit under women's jeans? 2. I have large calfs, and atrophy'd quads - if this works (and I hope it does) ideally the calf will get smaller and the quad will get bigger. How much adjustment will the adjusting straps give as I go through weight loss? The Nano is considered a "off the shelf" brace so if is measurmed with three measurments and has a range in each size. So a brace at one size will only fit a certain range then will need to go to another size. A Custom OA Defiance is made specifically for your knee and if you loose weight the brace can be re-made for a smaller charger than purchasing a new brace. To do an unloading brace we would need to know which compartment to unload either the mediual or lateral to get that benefit. If you have severe OA in both compartments the only brace that will be able to offloead either side (only one side at a time) will be the Defiance. Knee center=16"; Calf=13". What size knee brace should I order? I have bone on bone osteoarthritis and I am considered sedentary. If my Doctor writes a script for the Nano Brace will my Medicare Part B cover. I was told it would. And if so how do I go about working with you on the Purchase? In order to have insurance pay for your brace you will need to get in contact with the local Don Joy rep in your area. http://www.djoglobal.com/contact-us/sales-rep-locator The rep can help with ordering and billing your insurance. I have had a Donjoy OA NANO brace since Nov 2013. I run 3 times a week with the brace and it has served me well. However, the material that pads the inner frame of the brace is detoriating. Can the padding be replaced and if so do you provide such a service. You can order the liners for the OA Nano by calling DJO Global direct at 800-336-6569. You will need to know what size brace you have and what compartment the brace is for. Better Braces does not deal with insurance or bill them directly. Your specific insurance may have regulations on getting a reimbursement, but if you would like to pay out of pocket, you do not need a prescription to place the order through Better Braces. OUr OA braces push the knee towards the opposite side to unload that same opposite side. You were correct you will want to go with the lateral brace and you will adjust from the medial side to push the knee towards the outside. How long should the OA Nano Brace Last? I have worn My Brace Daily for a little 13 Months, and the Metal Frame has Broken. The Frame that Cover the upper Thigh has Fatigue Cracked and it totally separated. Would l=this be covered under Warranty? I like the Brace, and it really helps to reduce the swelling and Inflammation. Although the OA Nano has a one year warranty on the frame and hinges the frame should not have broken after such a short period of time. Please call me at product support 888-405-3251 so I can arrange a replacement. And get your brace sent in to us. I bought a DonJoy OA Reaction Web Knee and it has served me well, except that the velcro wore out and you replaced it. My condition has worsened dramatically and the brace isn't effective anymore as far as pain control...still feels supportive, though. I was never sure if the offloader idea really worked. A rep came by to make sure I was wearing it properly. How do you know if offloading is working? Less pain? Anyway, I can't get a knee replacement for several months and I was wondering if a stronger brace might help until then. My main activities where I used the brace were low impact aerobic dance and brisk 3-5 mile walking. I have had to stop since even with the brace I have terrible pain afterwards. I used to be a very active sport player playing soccer, tennis etc and 8 month ago fell in love with badminton, then my OA knee is getting worse. May this brace help if I wear it while playing badminton? Yes the OA Nano is for very activie people and can be used duting actvities. The brace will unload either the medial or lateral side of your knee while wearing it. I am a MRI Technologist. Can the uploading brace be worn while working in the MRI suite? I need to find out if all of the materials are MRI safe. This in reference to working in MRI, not having a MRI. I am (had been) a marathoner and long distance triathlete. I suffered a torn medial meniscus in right knee and previously had experienced some off-and-on mild knee discomfort. I had knee surgery to trim both the medial and lateral menisci. Unfortunately, the surgeon also felt the need to clean out the arthritis in the knee. There was one very small area of bone-on-bone (~10 mm.) Now the load transfer thru my knee is completely different, and I constantly experience discomfort and stiffness at the front of the knee, even in the absence of physical activity. I have a leg length difference with the right leg being about 1/2" shorter, which likely led to the more extensive damage in the right knee over the years. A recent MRI showed the following in the Bone Structures: "The patient has mild medial knee compartment joint space flattening. There is also mild flattening laterally. Marrow edema is present in the posteromedial aspect of the lateral tibia plateau I do not see a fracture line. There is also subtle marrow edema in the medial femoral Cordele as part of the medial knee compartment. There is moderate cartilage loss on both sides of the medial knee compartment less pronounced laterally." I do not plan to run any more marathons, but I want to be able to walk vigorously and maybe run a few miles on hard-pack, even surfaces a few times a week (or use elliptical or tread-mill.) I also want to be able to ride my bike long distances. What do you suggest to partially redistribute load thru brace to relieve pressure on knee, reducing the pain in front and preventing further damage? Damage is bilateral so I do not want to redistribute load laterally. Please be specific in your brace recommendations because there are a lot of options. Thanks. I have a nano brace and the metal on the top inside has broken, literally broken in half causing it to lose its off loading benefit. What are my options? I am trying to figure out which OA brace would be right for me. I have been looking at the OA Nano and the OA Adjuster. I have been diagnosed with mild degenerative changes of the medial meniscus (right knee) and I also have a mild case of genu valgum (knock knees). I'm looking for something that I can wear everyday. I do go to the gym a couple of times a week, but work a sedentary job. I am also trying to figure out what size would be best (knee center- 14.5, thigh - 18, calf - 15/ I'm a 5'5" female). Also, I want to verify that i would gat a brace for right medial. Any information would be greatly appreciated. I have a small articular cartilage defect/tear near the lateral femoral condyle. Is this brace suitable? question: 1) can I play tennis freely with these braces? if so what type? 2) will I still feel some pain while playing? 3) will this restrict any moving, turning while playing tennis? Will Nano brace set off the metal detector at airport security? What is the best way to clean the straps and liners of the OA Nano brace -- can they be put in a washing machine? As an OA sufferer who has had four Arthroscopic Surgeries and was told they needed a knee replacement over ten years ago but that I was to young. I would have to wait until I was Fifty. I am now 46 and am in daily pain but I am very active with backpacking, skiing, cycling, and gym activities, not to mention my professional duties as an Emergency Medical Technician. I cannot afford to be sidelined but I have been experiencing that on an increasing level so much so that I was begging my Dr. for the knee surgery. My MD suggested Cortisone Injections (no help) Synvisc lubricating injections (made me worse). We were right back at square 1. I was then told about OA knee braces and the relief people were getting, so off to the research. I finally got to talk to my MD about it and he was skeptical but told me to go for it. Now after using the Nano for just over two weeks, I am very happy I even walked around Disneyland for 9 hours without anymore pain than I would normally be in. I wear it in the gym, and at work. The popping I was experiencing seems to be a thing of the past and at the end of the day I feel pretty good. after just 2 days of wearing this knee brace the doctor ordered me my left knee is now 100% pain free thats going from needing knee replacement surgery 2 weeks ago, this is the 1st brace from this co. and although my last 2 braces were ok they were bigger, heavier, and had a weak spot i had 2 of them that broke in the same place other then that it constantly slipped down to my ankle, this brace does not move an inch i have to say i,m very very happy........the only issue is now that my left knee is pain free i can feel all the pain in my right knee which i never paid attention to because my left knee hurt so bad, i know its early on but thumbs up for this brace i only hope it last me, but hospital did tell me had lifetime guarantee so who knows, thanks for making a brace thats allows me to not feel that horrible pain i have dealt with for years and knee replacement will now be put on the back burner. Delay the knee replacement! These braces are light weight and easy wear. Your weight is displaced from the knee and most activities are pain tolerable. Instructions are difficult to understand. Once you understand that one set of instructions is for the brace and the other is for the installation of the slip band. Still have straps and not sure what to do with them. Pros: When installed so it does not slip down the brace supports so I can stand for extended lengths of time. Cons: Instruction need to be reviewed so patients can understand the proper use of all included parts. Had cartilage removed from left knee. After surgery pain was gone. Started working again. The pain of an ice pick trying to dig it's way out. Went to doctor. They prescribed this knee brace. Soon as it was put on pain went away. They told me to wear it when I expect to walk a lot. I can't even walk around my house without it. I wish more products would work as good as this does. No pain when wearing. Cons: Need adjustments don't know how. Tech that fitted me no longer works there. No one knows anything about it. Good brace but directions were a little difficult to follow. Once figured out it was good to keep my knee stable, thus relieving pain. The brace is light, comfortable and effective. I am extremely pleased with the knee brace. The brace is very effective. Great product. This is a great brace. Once I got it adjusted it fits great. Does not move or chafe. I wear them all day and I can tell the difference when I don't. Not real comfortable to drive long distances in. Not very bulky so they fit beneath most pants. Less than a pound each.